Looking for a digital USB microscope that will take photographs of specimens at the touch of a button? Look no further than these five top choices for every budget. Just a few decades ago, microscopes were a rarity, with only those who went into further education studying the sciences getting to look through their lenses. These days though, everyone has the chance to see the world magnified under a scope, and it truly is a spectacular thing to see. Even better, as technology is advancing more and more every day, we’re now able to get inventions once only seen on the likes of Star Trek. Once such gadget is the idea of a microscope that can be attached to your computer via USB. Is it For Educational Purposes? What does this do, you ask? Well, it lets us take photographs of what we’re seeing magnified under a scope at the touch of a button. Perfect for scientists collecting images of cells for a dissertation, these USB type microscopes can also be seen as a wonderful household gadget. Whether it be for your kids to look at dirt close up, or for help completing that tricky cross-stitch pattern, there is a digital microscope for everyone in the family. See how the top USB digital microscopes compare in the table below. Now, read about our recommended models in more detail. See why each are outstanding in their own right and which one we would choose over all others. Upon first glance, the OMAX USB digital microscope can seem pricey – especially compared to others on this list. However, this model is actually viewed to be an absolute bargain in the world of science. This is because microscopes in this price range very rarely come with such magnification ratios as 40X to 2000X. Instead, these magnifications are far more likely to be found on more high-end microscopes that will set you back hundreds of dollars more. 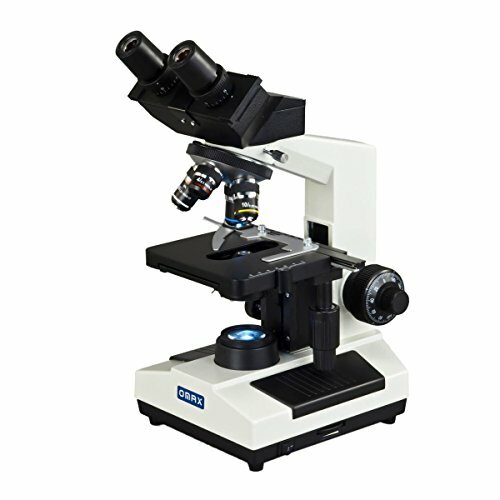 With this magnification comes a great deal of versatility to the buyer, as the range allows students and professionals from all branches of science to be able to use it. The included objectives will allow the user to examine specimens from the likes of microbiology and cells used in medicine in a crystal-clear light. From an engineer or physicist’s point of view, it’s perfect for analyzing the tiny components and circuitry that make up a piece of electrical equipment. The price doesn’t compromise on quality either, here you will find specimens under your microscope appear clear and bright. Often, when a microscope is considered a bargain, it lacks in image clarity, but this is far from the case. This USB microscope is also incredibly easy to work with, especially when it comes to your slide holder. These parts can often be tricky to use and, if flimsy, are often prone to breaking. Here the holder is simple to use – even for the biggest of fingers – and all knobs and controls feel firm and durable. There’s nothing that feels loose or cheaply made about this microscope. Of course, the real pull of this particular USB enabled microscope is the fact that it comes with a built-in camera. This 3.0-megapixel camera is an absolute must for any scientist, as it allows you take photos and videos of whatever you’re looking at down your scope. Once uploaded to your computer, these images can then be enhanced, such as brightening the image to make it look clearer. You can also crop your image, perfect for removing distracting white space or obsolete cells. These images can then be saved and used on scientific reports or journals. With such a bargain price, this camera will be tempting for students looking to add photos to papers or a dissertation. This built-in camera is incredibly useful, as it removes the need for trying to add your own digital camera. Every science student has, at one point, driven themselves mad trying to make their camera compatible with their microscope. How many of us have even tried pointing their camera down the eyepiece? The only drawback really is that the software used for your image capture has had reported issues with Macs. But for Windows users, the software works brilliantly. One other slight niggle is that the images produced on the screen aren’t always as crisp and clear as they appear under the scope. This is most likely due to the resolution quality of your monitor, so it shouldn't be an issue with a modern high resolution screen. Has a high range of magnification ratios making it very versatile. The built-in USB camera takes away the hassle of trying to set up your own camera, and images can be transferred straight to your PC. Might need to upgrade monitor to view images at their best. Bottom Line: If you’re looking for a microscope for your science studies or even in a professional capacity, the OMAX is ideal. You’re getting a lot for your dollar here, so although it can seem pricey, it’s worth every penny. Like the OMAX, this AmScope microscope is incredibly versatile. Armed with five magnification settings: 40X, 100X, 250X, 400X, 1000x and 2500X, this wide range of magnification rations will let you view everything from insects to the tiniest cell components in our bodies. This is why this microscope is marketed at such a wide array of people. Its highly reasonable price makes it affordable for students who are studying medicine or biology, and could even be a useful gift for a high school student who’s looking to major in science when they go to college. Its ease of use, also makes it a useful tool for class demonstrations, which makes it a very popular purchase for schools and colleges. Plus, it’s powerful enough for use by professional bodies in clinical trials and for use in a laboratory. If ever there was a microscope all-rounder, it would be the AmScope B120C-E1. Another plus point is that the microscope comes with a Siedentopf binocular head, which are arguably the best heads you can get on a microscope. 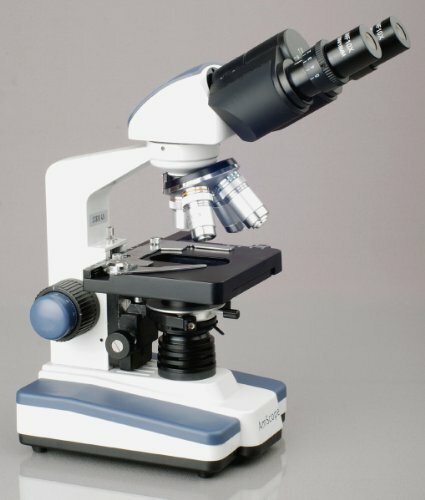 One of the reasons this microscope is so favored for teaching demonstrations is due to its ability to live stream what is being seen on the microscope straight to a computer screen or projector. Microscopes with cameras are essential for effective teaching in a laboratory. Students can often struggle with knowing what they should be seeing under a microscope. This can leads to a lot of anxious pulling of teachers to a microscope to see if they have it focussed correctly. Which can be difficult, as people all have different eye-strengths, so different focus points are needed. However, by streaming what a student should be looking for on a demonstration microscope, this allows students to sketch or take a photograph and then find it themselves. This saves time and energy for everyone involved. The camera itself is 1.3 megapixels, which although is not as high as the OMAX, still makes for a very decent camera. The one drawback here is that the USB is not currently compatible with newer 3.0 USB Mac products, so be careful that your computer is compatible before you buy. The camera software is superb. Working in a way similar to Photoshop, you can brighten and tidy up your image ready for scientific papers. You can even add measurements, to give your readers a size of scale. For professionals or students who find themselves glued to their microscope for hours every day, the AmScope is a comfortable choice. The 30-degree inclination of the microscope is aimed at being ergonomically efficient, allowing for a more comfortable way to use your microscope without straining your neck. Wide range of magnification options for the price. Siedentopf binocular head and glass optics make for clear imaging. USB camera is simple to use with useful software for editing. Ergonomic design makes for comfortable use. Not compatible with USB 3.0. Bottom Line: As USB microscopes reviews go, the AmScope gets top marks. It’s incredibly easy to use for such a high-performance piece of equipment and has a host of features that will suit multiple branches of science. If you’re looking for a portable microscope that is more suited to hobbyists or students, then the versatile Celestron digital microscope should be at the top of your list. This isn’t a computer microscope aimed at professional microbiologists, it simply doesn’t have the magnification, but for viewing large and/or 3D objects, this handheld microscope ticks a lot of positive boxes. The magnification ratio itself ranges from 20X to 200X. Yes, this is less than others on the list, but it’s important here to look at the quality of these lenses. The Celestron is equipped with a 5-Element IR cut glass lens. This makes for exceptionally clear images. As mentioned before, this portable microscope is best suited for 3D objects. This means that it is best suited for objects such as insects encased in resin, coins or stamps. The sort of objects that are visible to the naked eye, but you would like to look at closer. This could be for something like authentication or studying nature. To make this easier, the microscope comes with a height adjustable stand. This means for objects that are particularly bulky, you can adjust the lens higher, allowing for the object to be placed under the lens. There are even little clips that can fix your object or specimen in place. This is particularly useful when looking at fabrics or coins that might shift easily. It’s worth bearing in mind here, that some people might get annoyed by this stand as it can become tedious to manually shift it every time you have a new specimen to look at. Overall, though, this stand is more useful than it is a burden. Perhaps one of the most exciting aspects of this digital microscope is its 5-megapixel inbuilt camera that can capture both photos and videos of your specimen. The highest resolution of a camera so far on this list, if you are looking for clear images, then this microscope might be exactly what you’re looking for. Particularly good for use in archaeology or in the study of nature, you’ll be able to take crystal-clear images for use on presentations or even brochures. Or, with such a good price, you might be tempted to use this USB magnifier for your own hobbies. It’s a brilliant companion for a stamp or coin collector. Similarly, if you’re looking for a gift for a budding scientist in the family, the Celestron is a very simple microscope to use even for children. They will be able to collect leaves and dirt from the garden, view it under the microscope and even get images straight on to the family PC. The accompanying software to the Celestron is both Mac and Windows compatible and comes with some very handy features. Like others on this list, the software allows you to enhance and trim your images to make them more pleasing for a report or even just your own album. Another useful aspect of this software is that it allows you to add measurements and notes to each image you take. This is incredibly useful if you are taking a lot of photos of different specimens, allowing you to number/name each so you don’t become confused. Versatile for use by a large number of people as well as being reasonably priced. The camera is an impressive 5 megapixels and the software is easy to use with a lot of useful features. The adjustable stand has the potential to be tedious. Magnification not as large as other microscopes offer. Bottom Line: If you’re looking for one of the best USB microscope bargains out there, you can’t get much better than this Celestron. Perfect for professionals, hobbyists and even kids, this versatile piece of equipment has a multitude of uses. As brilliant as the microscopes are on this list, none of them have been truly portable so far. True, you could pack them up and take them on a train to your school or college but, at the end of the day, to get the images you want, you’re going to have to have it hooked up to a PC or laptop at the same time. For an independent piece of equipment, the title of the best pocket microscope has to be given to the Koolertron digital microscope, as you don’t need a computer to see your images. Instead, the specimen you are viewing under the microscope lens is viewed on its own 4.2-inch full LCD screen. This makes for a very nifty way to use a microscope, as it opens up a whole host of opportunities that a regular microscope viewer doesn’t allow. For one, you can this microscope during repairs or when making something intricate. Just think, if you’re trying to work with something fiddly, such as a circuit board, it can be uncomfortable to work with a regular microscope. The addition of an LCD screen eliminates this discomfort. You can just sit normally and work away, using the screen as a guide. The same principle works for designers making jewelry, who want to see their work up close. Again, like the AmScope, the Koolertron makes for a useful teaching microscope. When used in a science class, teachers can see what their students are viewing while they’re working. Which stops that awkward switch of seats so that your teacher can have a look at your work. The magnification ratio of this microscope is incredibly impressive, ranging from 10X to 600X. This is more than the Celestron is offering, but is not quite strong enough for those looking for a microscope suited to microbiology. 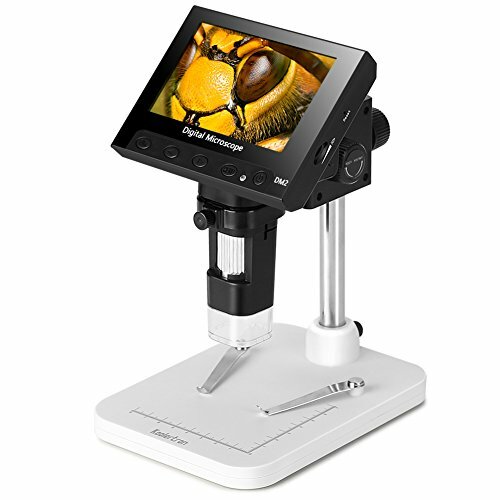 When used in other scientific branches, or for a hobbyist, this digital microscope reviews are very positive. As well as the great range of magnification, this microscope benefits from 8 LED lights that you can alter to get the best illumination for your specimen. When in use, your screen can add a measuring scale, allowing you to measure in real-time. These measurements, along with any photos or videos of specimens are stored on the 32GB microSD that comes with the microscope. These images can then be transferred over to your PC using the microSD, or you can even hook the microscope straight to your computer using a USB. It really is a very versatile piece of equipment. The portable nature makes it very versatile. Able to view specimen on an LCD screen rather than through a viewer. Can be used with or without a PC, so perfect for using outside. Level of magnification might not suit everyone. Bottom Line: If you are looking for a microscope that is entirely portable, you can’t get much better than the Koolertron. It’s versatile and innovative in nature, and can be used for a multiple of things – both professionally and at home. 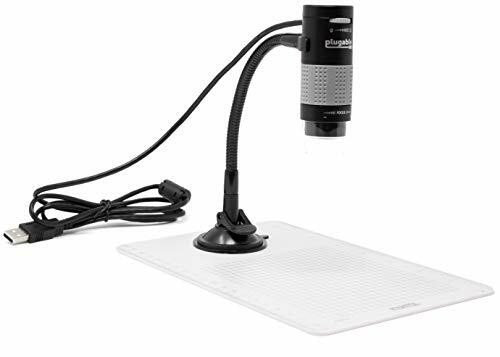 The Plugable USB Digital Microscope is a super value option for anyone looking for your average USB magnifier. Its main plus being, it’s just really simple to use. You won’t need booklets of instructions or need to scour the internet for video tutorials here, just plug the microscope in and you’re ready to go. With a magnification of up to 250X, this is another portable microscope that is more suited for hobbyists or professionals who don’t need to magnify their work to higher extremes. Perfect for insects, stamps, and coins, you’ll definitely be impressed with the clear images. There’s even a stand to keep the camera steady and avoid any annoying blurred images. As digital microscopes review points go, the Plugable is generally privy to a lot of positivity. One key complaint that continued to come up, though, was people complaining that they couldn’t get the full 250X magnification of their screens. This, however, is mainly due to two mistakes we make. For one, our monitor size might not be able to handle the 250X magnification. In this case, you might want to get a bigger screen or stick to a smaller magnification. The second problem is that beginners to microscopes can find it hard to focus on a specimen. When you go up the magnification of a microscope, the specimen goes fuzzy. This can really confuse novice users, who don’t realize that if you keep turning, your subject will eventually come back into focus. The key to success with microscopes is practice. No one turns on a microscope for the first time and becomes an instant master of that craft. With lots of practice, you’ll find yourself focusing in on your specimens far easier. The microscope itself has a useful flexible stand. This is very practical for moving around and focusing in on objects like circuit boards that you’re trying to fix. This picture can be streamed right on to your computer screen, too, so you get the best view. A LED halo light allows you to adjust the brightness levels on this microscope using the dial on the front. There’s a good range of brightness levels, so you can experiment with what works best with the specimen you have. The light also turns off automatically when not in use, which is incredibly useful for the more forgettable amongst us. When taking photos, you have two options. The easiest method is to use the camera button contained within the software. Or, you can use the shutter button on the actual microscope. Be careful when using this method, though, as if you shake the camera too much your image will be blurry. It tends to be best to use the software option to ensure a clearer image. The 250X magnification is more than enough for most projects. Easily transported if needed for work or school. Can be hard to focus specimens at a higher resolution. When using camera button on the microscope, the image can appear blurry. Bottom Line: If you’re a hobbyist or student looking for a simple portable microscope, then this is an affordable option that will certainly do the job. If you need something more professional, you might need something more advanced. There’re really two battles on this list of microscopes with cameras, and that is between the higher-end OMAX and AmScope and the more portable options on this list. Looking at the OMAX and AmScope, both are brilliant in their own rights, and it's hard to really split them. The OMAX has an amazing camera and is incredibly well crafted. It really does have a professional feel to it with a stage with a really smooth action. But, it is significantly more expensive. The AmScope has impressive magnification power and is very easy to use. 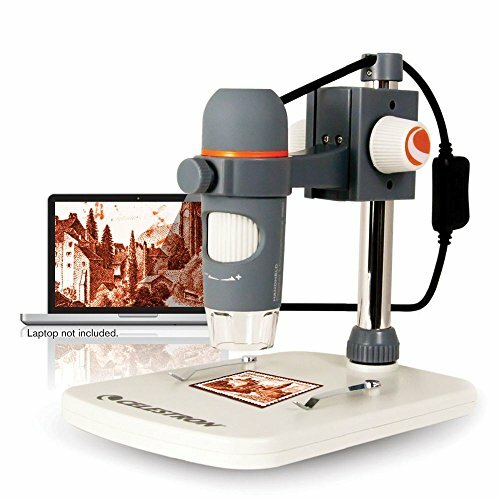 Suitable for professionals and students alike, this versatile computer microscope is perfect for class demonstrations and college projects. Its ergonomic design is also very important for those who regularly use their microscope too – a normal microscope can cause substantial pain in your neck and back when overused. Plus, the software of the AmScope provides everything any scientist needs to get through the day. Choosing between the two really comes down to personal preference and budget. We'll leave it up to you! For a microscope that is both great value for money and portable, the Koolertron and its LCD screen will win your heart. That screen viewer is just so innovative to anything else featured on this list. The possibilities this microscope gives are endless. Even better, it makes for a wonderful present for both children and older adults whose sight might not be as good as it once was. Looking at microscope specifications can be enough to melt anyone’s brain – there’s so many specifications and other jargon to wrap your brain around. Fear not, though, here are some top tips for finding the best computer microscope for your needs. When it comes to using a microscope, people generally fall into two different areas – professional or hobbyist. With the professionals needing a more complicated and expensive model compared to the hobbyist. So, if you need a microscope for your job, do you go for the most expensive? Well, before you waste a lot of money, the professional vs. the hobbyist rule doesn’t always work out. Instead, it makes far more sense to base your purchase upon the magnification you need. Generally, a hobbyist isn’t going to need a laboratory-grade microscope that lets you look at bacteria and cells up-close. Rather, any microscope that goes up to around 250X will be fine for your needs. This type of magnification will give you superb close-up views of insects, stamps or anything else you’d like to inspect. For a scientist, such as a microbiologist, you’re going to need a microscope suited for a laboratory with a high resolution and glass optics. These will be on the pricier side of the scales, such as the OMAX or the AmScope mentioned on the list. Then there’s the professionals who, yes need a microscope for work, but don’t need a microscope that’s more suited for spotting mitochondria. Such professions might be those who deal in jewelry, collectibles, and archaeological items. Here, you’re going to have to research what magnification others in your field like to use, and from there look at suitable microscopes. Most likely, something like the Celestron with its versatile stand and 5-megapixel camera would be most suitable. If you own a Mac rather than a computer loaded with Windows, you’re going to have to be careful about any digital microscopes you look at. Many of them come with software that is known to be buggy when used on a Mac, and there is little point of getting a microscope with a camera if you’re unable to look at any of your images. Similarly, most of these microscopes work from a USB. Most USBs we use are 2.0, however, newer models of Mac computers and laptops are USB 3.0. Again, you will need to look closely at the specifications to ensure it will work with your particular computer. Digital microscopes are particularly good for students, but just because your child loves science, doesn’t mean you need to shell out hundreds of dollars for a fancier microscope. Until your offspring head off to college to major in something like biology or medicine, there is really no need to buy a high-end model. Rather, the budget-friendly options on this list will more than help them through their studies – even right through high school. Instead, try to aim for a digital microscope that is also fun. If you want to keep your child interested in science, it should never be a chore. Otherwise, they’ll ditch the idea quicker than you can say “Nobel Prize”. Try to aim for one that’s easy to use and portable. This means that, when they are young and want to play outside, they can use their new microscope to look at nature. Then, as they get older, they can even take their microscope to school or for study groups. On the other end of the scale, if you’re thinking about getting a microscope for an aging relative, look for something that is simple to set up and use. The Koolertron with its LCD screen could be ideal here. Not only is it simple to use, but the screen makes it much more practical for using on hobbies around the house. Plus, there’s no need to plug into a computer for those of us who dislike using too much technology. Just think, hobbies that had to be given up due to bad eye-sight might still be possible – which will bring immense joy to that person! Digital USB microscopes are just another step forward in some wonderful advancements in accessible technology. No longer are microscopes just for those Brainiac people who head off to collect doctorates. These are something everyone can enjoy and make use of in our daily lives. The microscopes featured on this list give something for every need and budget, they even make spectacular gifts. So, if you know someone who’d benefit from one of these wonderful gadgets, you’ll know exactly what to get them for their next birthday.